Worries about a global slowdown have discounted shares of a company that expects growth in a number of key areas. Shares of Honeywell International (NYSE:HON) were cruising along nicely in 2018, up more than 8% year to date in early October, before crashing back to earth and finishing down 13.8% for the year, according to data provided by S&P Global Market Intelligence. For patient investors, the drop could be an enticing buying opportunity. Check out the latest Honeywell earnings call transcript. Honeywell's October swoon corresponded with double-digit declines for peers like United Technologies and General Electric, and seemed to be driven more by concerns about a potential Chinese or global slowdown than it was based on anything company-specific. Indeed, Honeywell's third-quarter results, announced mid-month, were strong, and the company raised its full-year earnings guidance. HON 2018 price movement data by YCharts. Before year's end, Honeywell completed the spinouts of its auto-turbocharger business Garrett Motion and its Resideo Technologies home-products business, leaving it focused on areas such as aerospace and warehouse automation that appear poised for higher growth. CEO Darius Adamczyk, who called his stock a "steal" earlier in the year when it was trading much higher than at current prices, said the aerospace arm is in growth mode, and the company expects 10% growth in its safety and productivity solutions unit. For the foreseeable future, Honeywell shares will likely be influenced by headlines about trade wars, and investors will continue to look for signs of economic growth (or weakness) in China. So it's difficult to predict what direction the shares will take in the months to come. But regardless of stock movement, this is a solid company entering a period of enhanced growth; in October, Honeywell forecast free cash flow conversion of around 100% in 2019, and a $600 million improvement to working capital. Honeywell also has ample balance-sheet power to do an opportunistic acquisition if it sees anything appealing. 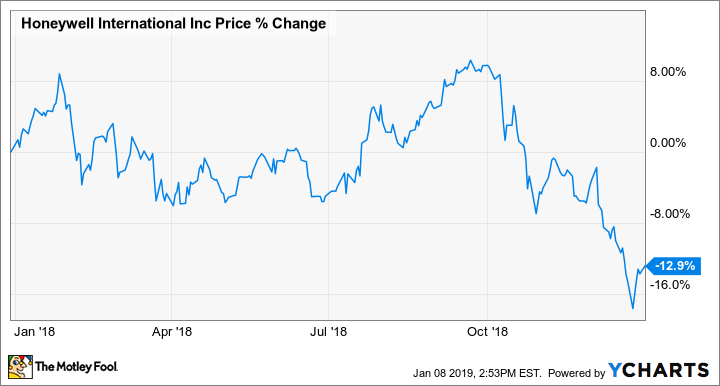 Back in October, with Honeywell trading at around $165 per share, I described the shares as "not cheap" but still called the company "one of the more attractive large industrials to buy today." Off $30 per share since then, Honeywell looks like a solid buy.